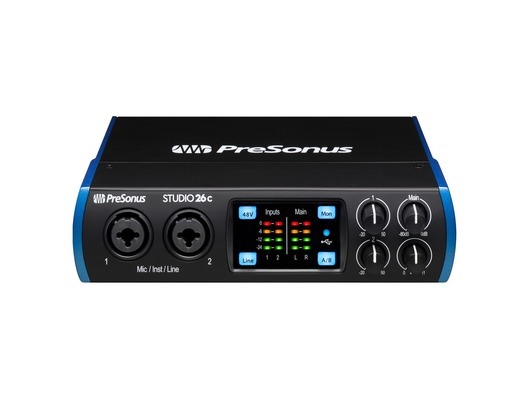 Here we have the PreSonus Studio 26C audio interface. 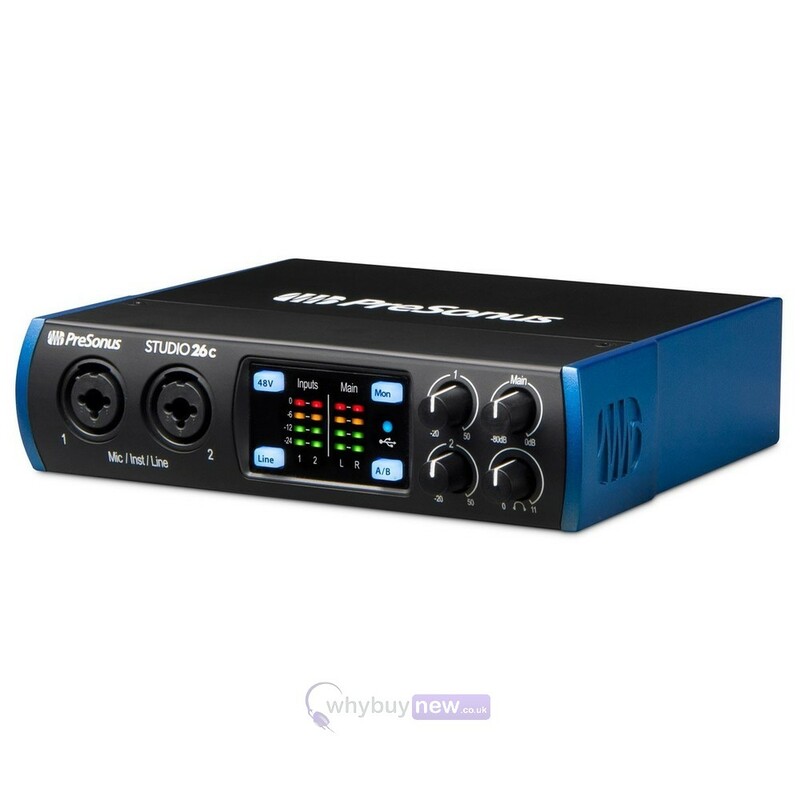 This small-but-mighty device comes complete with 2 combi mic/line/instrument inputs, MIDI I/O (great for those who want to plug in a MIDI keyboard or production controller for full song creation), DC-coupled line outputs and even a Cue Mix A/B button for switching between two mixes while monitoring through headphones. 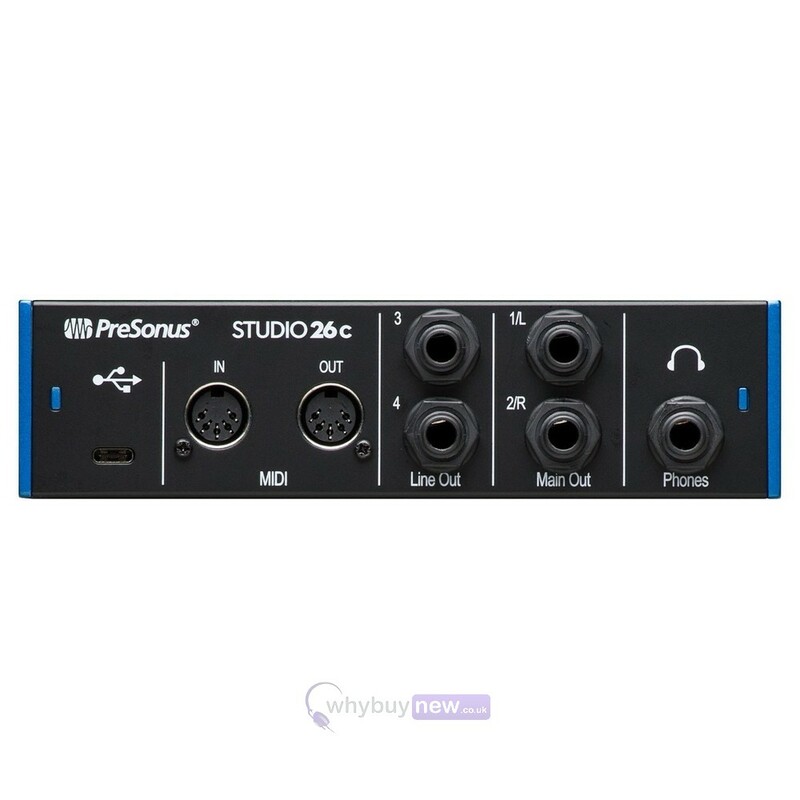 Studio 26C also comes with full music production software in the form of PreSonus' own Studio One Artist which has been designed to be very user friendly and therefore great for a beginner yet complex enough to satisfy an experienced industry professional looking to move into mobile music production. Ideal for DJs, mobile musicians, and electronic musicians who want excellent audio quality in a sturdy, portable form factor, the bus-powered Studio 26c 2-in, 4-out audio interface records at up to 192 kHz and features mic/line/instrument inputs, DC-coupled line outputs, MIDI I/O, and a Cue Mix A/B button. 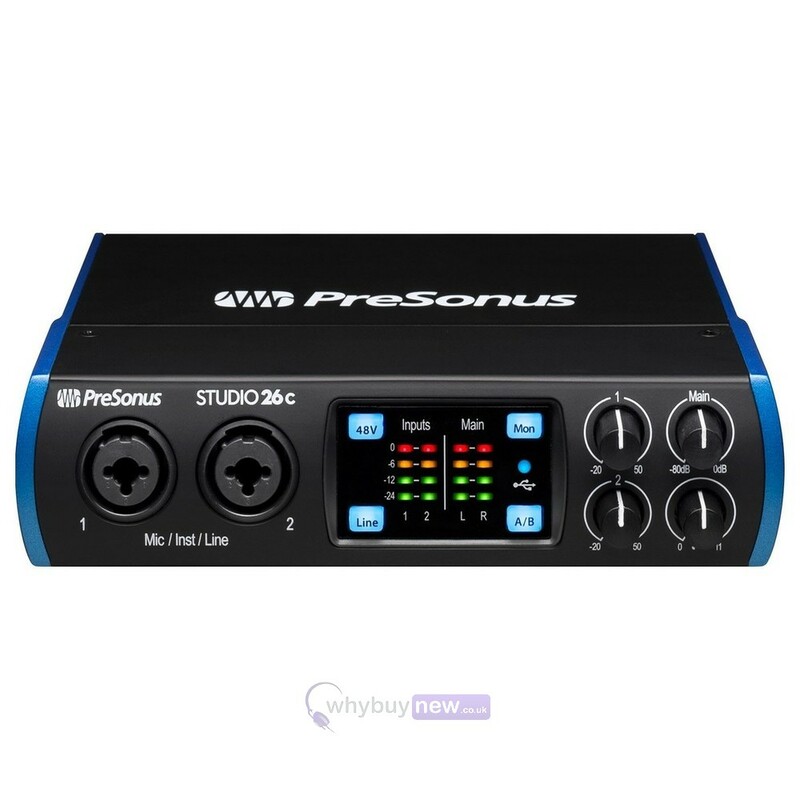 A complete, all-in-one recording package, the Studio 26c comes with PreSonus' award-winning Studio One Artist music production software for macOS and Windows and includes USB-C to USB-C and USB-C to USB-A cables for compatibility with most computers. 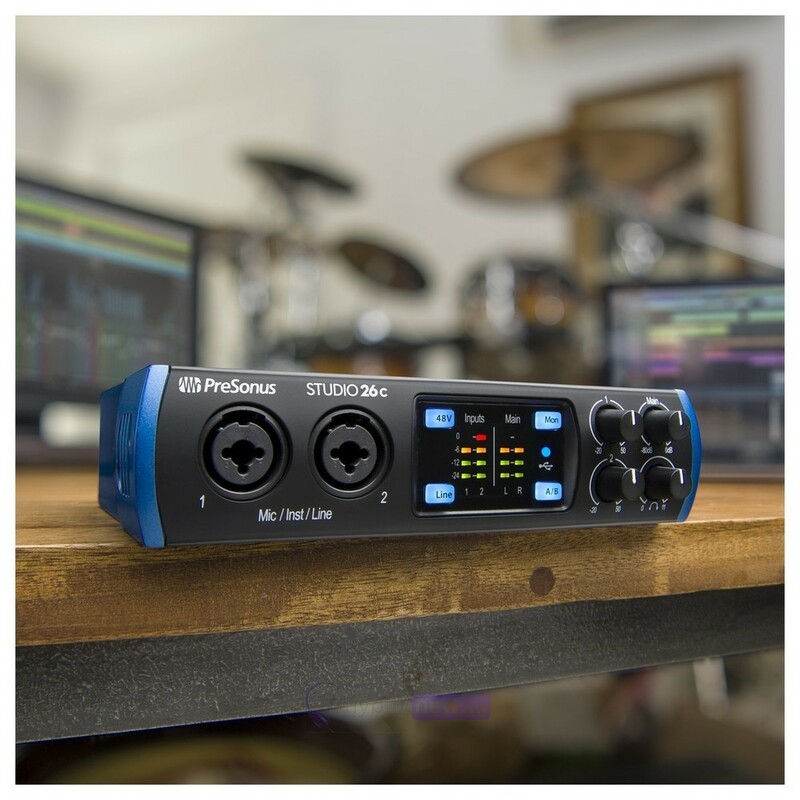 Seamlessly integrated with the included PreSonus Studio One Artist music production software, the Studio 26c interface works with virtually all macOS and Windows recording software. Easy to learn, Studio One enables you to compose, record, and produce without getting distracted by the tools. Need a new loop or sample for your latest production? Studio One lets you shop, audition, and purchase new content right from your production environment. 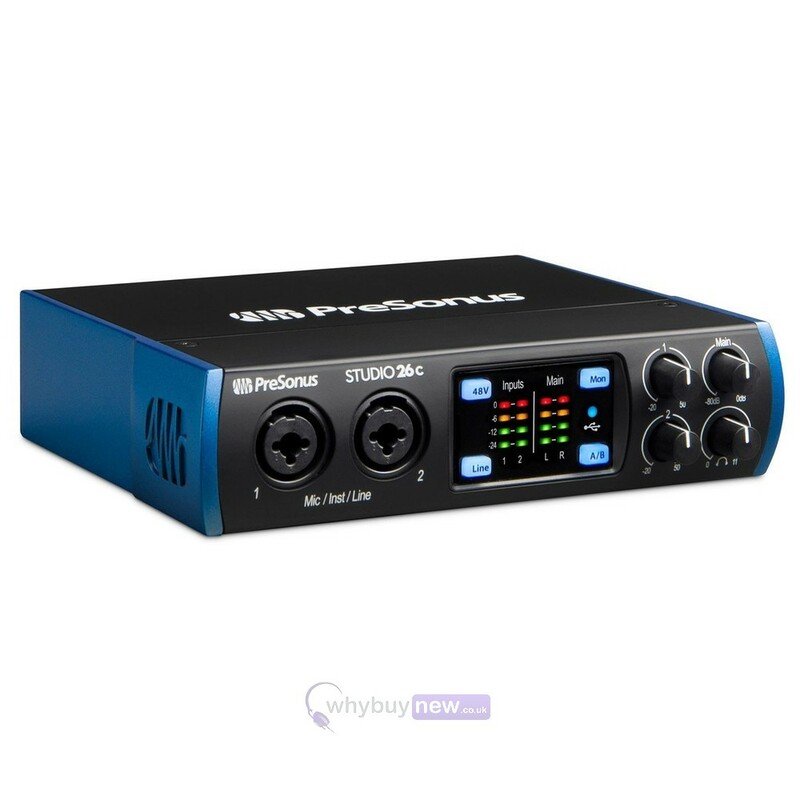 The 2-in, 4-out Studio 26c audio interface features USB-C computer connectivity and includes combo mic/instrument/line inputs with +48V phantom power for condenser mics; balanced, 1/4-inch TRS, line-level main outputs; and an output level control. All line-level outputs are DC coupled, enabling them to send control voltages. A Cue Mix A/B function lets you toggle between two mixes while monitoring through headphones perfect for DJs and to listen in on a performer's monitor mix. The Studio 26c's built-in MIDI interface enables connection to a keyboard, sound module, or control surface. The Studio 26c operates at up to 192 kHz for ultra-high-definition recording and mixing. High-quality converters on every input and output and PreSonus' professional-grade XMAX-L mic preamps capture complex musical harmonics smoothly and naturally, with no audible distortion. Designed for the home recording studio. Built for the road. Whether you're just getting into recording or are a veteran producer who wants to go mobile, the Studio 26c will give you clear, clean, ultra-high-def sound in a bus-powered, rugged unit. While it's a perfect companion for any recording software, the Studio 26c and included Studio One Artist provide you with a complete, affordable, home and mobile recording studio.